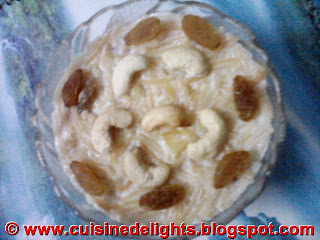 Payesh is an essential dish in many Hindu celebrations. While the dish is most often made with rice, it can also be made with other ingredients such as vermicelli.Payesh making is so simple...for most of the ingredients are available at home any and every time.Milk and sugar the main ingredients of Payesh/Kheer. Crash Cardamom : 1 tsp. In a saucepan start boiling the milk at low temperature.Careful not to scald the milk at the bottom. This is a long process as the heat is low medium. Meanwhile add ghee /oil to another pan and lightly fry the shimai until they turn deep brown. When you think it is the desired consistency add the sugar.Winter and Nalen Gur a good combo for this time of the year...can add this gur (jiggery) to the payesh for the distinctive flavour of the gur. When the milk has reduced to half add the shimai and keep stirring. Cook for another 5-7 minutes. Lastly spread powdered of cardamom. Semai payesh is ready to be served...You can gurnish with cashew and raisin.